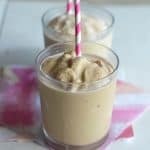 Blended Thai Iced Coffee – luscious cold treat made by blending coffee and coconut milk cubes flavored with condensed milk, vanilla and coconut sugar. Easy and so satisfying! There is Thai Iced Coffee and there is ” Blended Thai Iced Coffee ” I prefer this ” Blended Thai Iced Coffee .” What is the difference ? 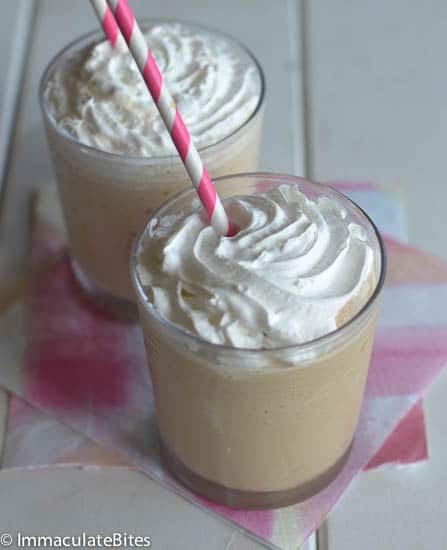 This one is made out of blending coffee and coconut milk cubes, which makes for a” smoothie like ” texture . I can’t call it smoothie because it doesn’t involve fruit or vegetables ,but it makes for one LUSCIOUS treat ! I just love it ! So does my family and friends . I can never make enough to satisfy their cravings,not to talk of mine. 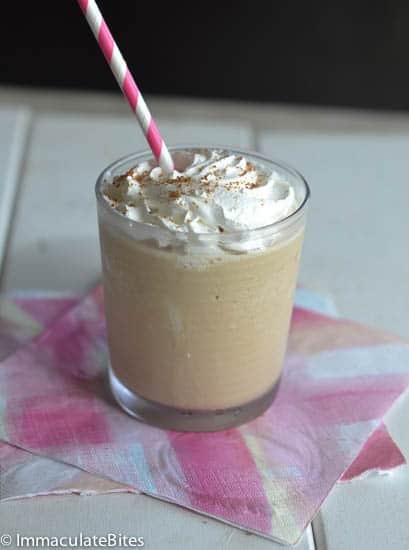 This is my ANYTIME favorite of mine – my guilty pleasure , spiked with rum and I am in “Coffee heaven” , although am not too big on coffee. Just one taste of this drink and you would understand why. 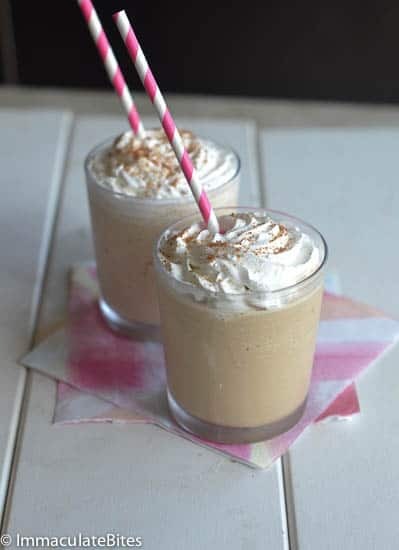 It starts by blending frozen Coffee and coconut milk cubes with creamy condensed milk , then topped with whipped cream and for a nutty flavor; coconut sugar. You can use this homemade coconut milk featured here or store bought coconut milk . I have only used the drinkable coconut milk in the cartoon, never tried the canned coconut milk. For the coffee ,I use coffee granules to make coffee. Use what you have available or freshly brewed coffee. 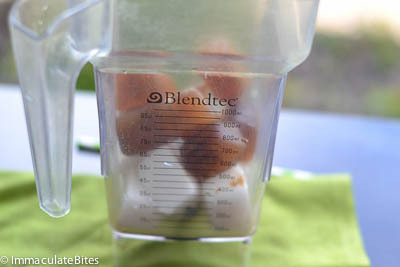 It is advisable to remove the cubes from the freezer about 15 minutes before blending to ensure easy blend. 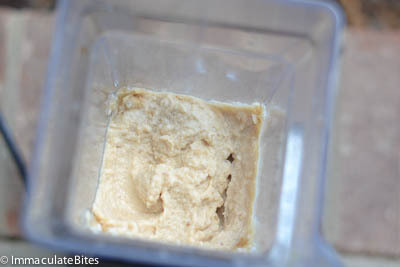 If you have too, add about a 1/4 cup of coconut milk to the ice cubes before blending. 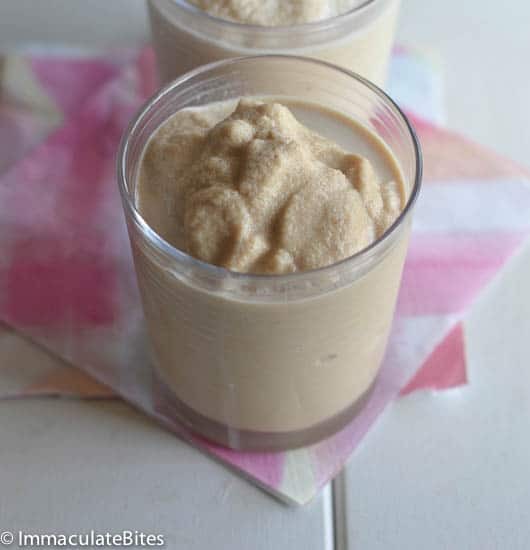 Blended Thai Iced Coffee - luscious cold treat made by blending coffee and coconut milk cubes flavored with condensed milk, vanilla and coconut sugar. Easy and so satisfying! Pour about 2 cups of cold coffee in ice cube tray ; place in the freezer to set , this may take about 3 to 4 hours depending on your freezer. 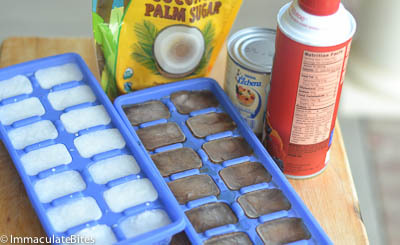 Do the same with 2 cups of coconut milk in an ice cube tray. Remove ice trays from the freezer when it is completely set. Leave outside for about 10 to 15 minutes, depending on the temperature . 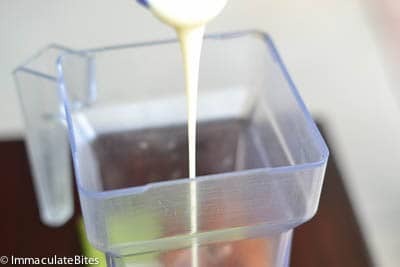 Place the ice cubes in a blender, add condensed milk and vanilla , blend until creamy and smooth. It is ok if not all the cubes blend. You might have to do this in two batches. Pour into glasses , top with whipped cream and sugar . Serve immediately. i cant wait to give this a try!! Good to know . Yay! for a coffee lover.